VMware's software defined storage, get your VVol (Virtual Volume) overview here! 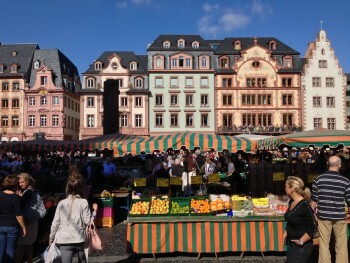 The lovely farmer’s market in downtown Mainz, on a beautiful Saturday Sep 27th, 2014. Right near the Gutenberg Museum. My work with IBM on VVol (Virtual Volume) over at IBM's European Storage Competence Center is now published! If you read TinkerTry last September, you know I went to work at Mainz Germany for a month. Now, you also know what I was really doing there. I love immersing myself in tech that's at the leading, speeding, and sometimes bleeding, edge. Using the latest software and microcode, pushing the boundaries of what's possible forward. Right up my alley. Months before it's "ready." I'm so glad I had my family's support for me to be thousands of miles away for a month, tackling this challenging work and a finicky Fiat stick-shift, in a very foreign land. With incredibly smart, experienced authors who were clearly way ahead of me. Like in tennis, that's a good thing, helps you bring your game up, in a hurry. The relatively compact size of Europe also gave me the chance to enjoy weekends in the fullest, exploring and photographing western europe. Topping it all off, the opportunity of a lifetime to reconnect with my ancestors. Brings chills to my spine every time I think about that feeling, the adventure and thrill of it all, the Belgium waffles (in Belgium! ), the autobahn, the stunning scenery. 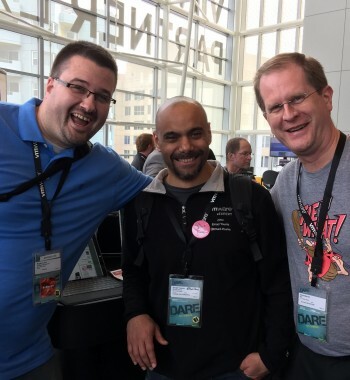 The exhilarating work in Germany later led to me flying off to San Francisco in early February for VMware's Partner Exchange 2015, standing right alongside HP's well known vSphere-land guy, Eric Siebert. Soon enough, I enjoyed the chance to also meet many distinguished bloggers and vExperts and VMUG leaders for the first time. Even had a chance meeting with HomeServerShow.com superstar Kevin Schoonover. Then there were the incredible IBM colleagues who I had never met in person before, including XIV's Stephen Solewin and FlashSystem's Kristy Ortega. The titans of virtualization storage were all there together, showing off the promise of the industry-wide VVol initiative. I thoroughly enjoyed talking to the many partners and colleagues who stopped by to hear what's coming their way in 2015. The very next week, I found myself traveling to IBM Tucson AZ, working with IBM's software defined storage solution now announced as Spectrum Accelerate. Yeah, February was a pretty cool month for me, while it was literally very cold back at home. The subtext of this post is not so much "look at me, my life is interesting lately," it's intended to be more "work hard and enjoy what you do, it leads to opportunity." 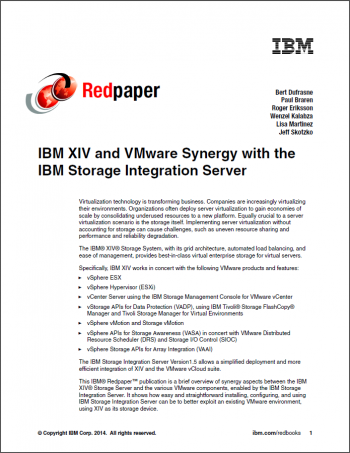 Many of you are already using XIV Storage for your VMware ESXi host storage needs. Some of you have made significant steps forward by enabling VAAI (vSphere Storage APIs), gaining a speed boost and some space reclamation controls. With 2015's expected VMware vSphere 6, coupled with IBM's XIV microcode announcement, you'll know longer have to just imagine not worry about LUNs, or the overhead of the VMFS filesystem (it's gone). Bless your vSphere environment with the ability to communicate directly with your IBM XIV Storage. Benefits of VVol include: ? increased simplicity for your vSphere admins ? increased granularity, creating snapshots of individual VMs instead of entire volumes ? GUI-based space reclamation controls ? dramatically enhanced speeds (featured in the lab demonstration video below) This video will teach you and tease you, giving you a glimpse of the great things to come from IBM and VMware in 2015. You'll be hooked on a feeling that you're well on your way to something even better. *I do not represent IBM in this post, or any post at TinkerTry.com. Opinions expressed here are my own, a disclaimer that appears above all 500+ articles.